← Kyan Shin’ei, in: Okinawa-ken Karate-dô Rengôkai (Pub. ): Okinawa Karate Jinmeikan. Naha, Okinawa-ken Karate-dô Rengôkai 1993. 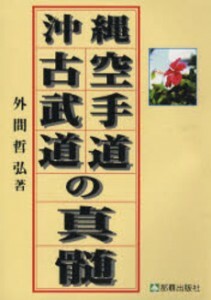 Hokama Tetsuhiro: Okinawa Karate Kobudô no Shinzui (The True Essence of Okinawan Karate and Kobudô). Haebaru-chô (Okinawa-ken), Naha Shuppansha 1999. 389 pp. , 21cm. Okinawa-ken Kyôiku-chô Bunkaka Hen: Karate-dô, Kobudô Kihon Chôsa Hôkokusho (Preliminary Survey Report of Karatedô and Kobudô). Okinawa-ken Kyôiku Iinkai, Naha, 1994. 179 pp., 26cm. Handed down in various rural areas of Okinawa and preserved by the people of these areas. Are performed all year together with traditional folk custom festivities. As „traditional sports of the villages“ they lead to pride and self-esteem. As it has been performed openly at the villages’ worship places, sacred grounds, and Utaki, from the connection with these sacred grounds the idea evolved, that it is a means for a building seishin, i.e. sublime heart, soul, spirit. 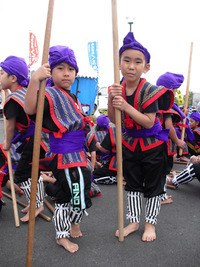 As a traditional sport which is “designated intangible cultural asset” of the towns and villages, from old times the Mura-bō have been transmitted as a “technical skill or art handed down from person to person”, together with the deepening of the understanding of Mura-bō, to start to acquire fundamental technical skills starting in childhood years, to respect politeness, to bear in mind safety, to practice independently on one’s own initiative, to learn the technical skills of the kata, to train mind and body and to continue to hand down the tradition in it’s present condition to the next generation. Now there is not much information on Mura-bo on the net. The reason is that there is not much information on Mura-bo anywhere. Fortunately The Preliminary Survey Report of Karatedo and Kobudo gives the different traditional staff fencing methods of Okinawa and surroudning islands. Mura-bō without name Yomitan-son Gima and Yamauchi 2 Villages. © 2011 – 2018, Andreas Quast. All rights reserved. This entry was posted in Book Reviews, Unknown Ryukyu and tagged Andreas Quast, Book reviews, Books, Budo, Bujutsu, mura-bo, Okinawa, Ryukyu, Ryukyu Kobudo, village bojutsu. Bookmark the permalink.